The landscape turns from deep green to sepia-yellow as we drive out of the tree-lined streets of the city and onto a dusty road lined with wheat fields. At some point we return to pavement and I glance out the back window to see a horse gallop across the road in our wake. Our taxi slows and turns onto a smaller road, meanders through an enclave of large white-washed structures, and comes to a stop in front of a cheerful looking building with students streaming through its front doors. As I step out into the sun, I look up and see that much of the top floor is being held up by a forest of bamboo poles. I am told that this is the future home of an in-house school that Rayat-Bahra College of Education is creating in order to give their students a more hands-on and supportive introduction to teaching. As we walk through the campus, a few students stop us in our tracks, greeting us with delighted namastes. ‘When is the next workshop?’, they ask eagerly. ‘We want one more before the semester ends.’ I’m struck by how enthusiastic they are, how thirsty to talk about what they’ve learned. They are also unusually at ease, telling us about their lives, chatting companionably as we walk the hallways. When we tell them that we have not come to do another workshop with students, but to prepare a two-day planning retreat for the teachers, they become even more excited. Ten minutes later we are seated in the principal’s office. Two members of the faculty have joined us and are proudly describing the experiments in participatory learning they have already embarked on in their classrooms. An animated conversation ensues about the upcoming planning retreat and the possibilities for expanding these kinds of experiments throughout the college. The principal listens with a gentle smile. She seems inspired by the potential for transformation that lies ahead, but also aware that systemic change takes time and requires patient cultivation. As someone who tends to get easily swept up in moments of shared excitement, I take a breath and absorb her grounded energy. 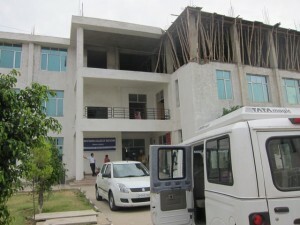 Rayat-Bahra College of Education is a teachers college on the outskirts of Chandigarh, Northern India, that is on the brink of a remarkable reform experiment. My hosts Harleen Kohli, Sumedha Sharma and Mamta Sain of CEVA have played a key role in sparking the changes underway. 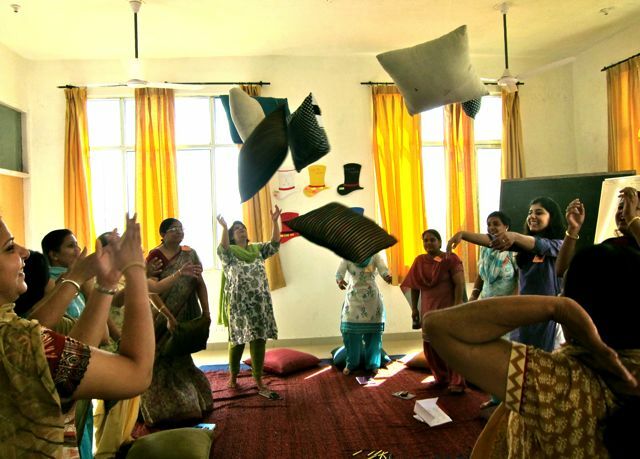 CEVA has been designing and hosting workshops on participatory learning in schools and community spaces for over 10 years, but this is their first experience working with a teachers college and their first attempt to affect change at a system-wide level. I met Harleen just a few days before at the Learning Societies UnConference in Bhir. 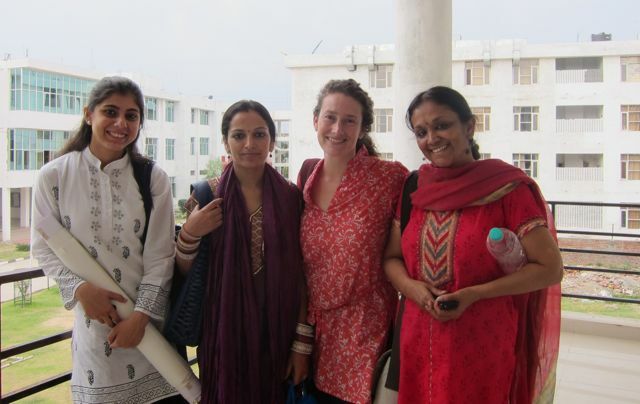 When she heard about the work of Organization Unbound and some stories of school reform from my organizing days in Baltimore, Harleen insisted that I come to Chandigarh to help CEVA kick-start their work with the college faculty. I said yes on the spot, not sure what I was getting myself into, but excited to jump in and see where things would go. Now, as my initial visit to the college winds to a close, I’m still unclear about the focus of the planning retreat that we’ll be facilitating in only two-days and unsure about my own role in the process. What I do have, however, is a much better grasp of the situation that the college is facing. In recent years, the principal and teachers have experienced a growing disconnect between their philosophy of learning and their ability to live out that philosophy with their students. Teaching methods that facilitate participatory learning are increasingly being promoted in the curriculum (and supported by India’s National Curriculum Framework for Teacher Education), yet as is the case in most colleges, students don’t get many opportunities to experience them first-hand. -Students are taught that active learning is much more effective than passive learning, but are still spending much of their time in conventional lecture-based classrooms where they have few opportunities to take true ownership of their learning experience. -Students are taught the importance of developing higher-order thinking skills, but much of their energy is still focused on memorizing information so that they can successfully reproduce it for their exams. -Students are taught that collaborative approaches to learning are more effective than competitive ones. Yet, their class sizes are so large and their class periods so short that they don’t have much opportunity to learn from and with each other. Teachers have begun to experiment with ways of addressing these inconsistencies, but there are limits to what can be accomplished within the confines of a classroom. As we taxi our way back into the city, my CEVA colleagues and I are feeling a mix of anticipation and anxiety about the retreat to come. The potential for real transformation at the college is so present, but we fear that the teachers might not be ready for the kinds of large system-wide changes that we’re so passionate about. What if the steps they want to take are too small for us? My feet are bare on the welcome chill of the linoleum floor. My heartbeat, already quickened from a cup of chai, increases as I attempt to catch the stream of pillows flying at me. The room is a swirl of color; the scarves worn by the women around me intermingle with the pillows. Eventually, the action dies down and we take our seats, breathless and eager to continue the work we’ve started. It’s day two of our planning retreat and I couldn’t be more delighted by what I am witnessing. Not only are the teachers embracing the most radical possibilities for reform we presented, they are diving effortlessly into the messy work of molding these ideas into doable plans. The atmosphere is loud and unruly. Ideas are hatched and quickly developed. Blocks are identified and brainstormed around. Fears are voiced and listened to with compassionate ears. By the end of the day, the teachers have made some major decisions. They have decided to approach the upcoming semester as an experimental term where they will be free to try out and tweak their ideas- and make mistakes. The scope of the reform is vast. It includes significant shifts like reducing class size from 50 to 10, lengthening class periods, and facilitating a daily open lab for students to engage with material with more freedom and creativity. All of these changes will mean the teachers will be immersing themselves in an intense period of learning and collaboration with each other over the coming months. Earlier in the year, CEVA had organized a workshop with teachers that had fallen somewhat flat. It was met with a degree of resistance and frustration that they were not expecting. There were probably many factors at play at the time, but a major one may have been the facilitators’ own mindset. CEVA carefully designed the session based on what they already knew and what they felt the teachers needed to do more of in the classroom. They went in with a preconceived idea of what participatory learning approach was and what it should look like, and then they modeled that approach for and with the teachers. For me, what was so compelling about the present retreat was that it went beyond models. 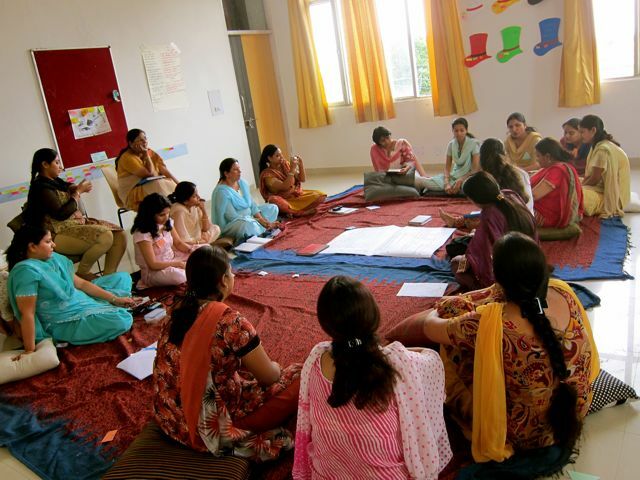 It was our own state of unknowing and eagerness to learn that played such a huge role in our ability to facilitate a deeply participatory learning environment for the teachers. We went in with a mindset of co-creating this experience together with the teachers and building from the experiments that the teachers were already doing. We started with the premise that we wanted to create a participatory learning experience for the students. But to create it for the students we had to create it for the teachers. And to create it for the teachers we had to create it for ourselves. Consequently, the vision that we were working on together – of the college becoming a living laboratory for participatory learning – came brilliantly to life in the retreat itself. There was a heightened spirit of learning and collaboration in the room. The only road map we had was the one that we are creating together. Each of us was seeing the other as a learner and expert, and we were prepared to take risks knowing that our mistakes would help us grow stronger. The more the staff continues to focus on creating an experience of participatory learning for themselves, the more they will be able to do the same for their students and for the schools they partner with. A model doesn’t radiate outward. The experience of the model does. So even if the agreed-upon reforms don’t move forward or move forward in different ways than imagined, whatever programs result will reflect that energy. To find out what happened next, check out my follow-up post.